Tires keep your car safely on the road, so proper tire maintenance is an important safety measure as well as good economics. A properly maintained tire will last longer and perform better. Hyack Excel Tire is an expert in tire care, and we are happy to help you look after your tires. Tires connect your vehicle and the road surface. Tires are a critical part of your vehicle’s suspension system; and are responsible for transmitting the forces of driving, steering, and braking. The first step in tire maintenance is to ensure proper tire inflation. The second step is regular inspections. We will check and adjust your air pressure at no charge! To a trained eye, tire wear can give early warning to front end problems. Hyack Excel Tire will assess tire wear and advise you of relevant front-end performance indications at no charge! Maximise the return on your tire investment. All new tire sales include first Tire Rotation at no charge. We recommend adding a Tire Rotation service with your seasonal tire changeover. If you notice any of these symptoms (tire problems) give us a call; if you have a flat tire we will fix it as soon as we are able. If your symptoms are more complex, we’ll set you up an appointment and get your car in the shop ASAP. the first flat repair on your set of new tires is also free. Hyack Excel Tire is a tire expert with over 30 years in the tire maintenance and tire sales business. We can diagnose and solve any tire problem you have. These symptoms are easy to notice. Give Hyack Excel Tire a call as soon as you discover any problems with you tires, we will get you fixed up and back on the road quickly. To maximise the return on your investment in tires or, in other words, to get the most life out of your tires; we recommend your tires be rotated on a regular basis. Front and rear tires will wear at different rates because front tires carry more than 60% of the car’s weight. So, front tires wear down faster than rear tires. Rotating tires equalise these natural wear patterns by changing their positions. vehicle drive type - all wheel drive, front wheel drive or rear wheel drive. Front wheel drive vehicles will need to have their tires rotated more frequently due to the additional wearing caused by stress from braking and the weight of the engine and axle. Regular tire rotation will ensure a smoother and safer ride. You can also save money in the long run by extending the life of your tires. Check your car’s owner’s manual for the recommended tire rotation schedule. Most manufacturers recommend that you rotate your tires every 10,000km. For vehicles that are used for heavy-duty or off road driving and have aggressive tread tires, it can be a good idea to rotate these tires at 5,000km to avoid uneven wear. Vehicle Safety. Damage from road hazards and abnormal tire wear may result in sudden and catastrophic tire failure. Maximise Tire Longevity. Premature tire wear results from inadequate inflation levels and improper rotation. Correctly inflated tires will allow tire sidewalls to flex consistent with their design and result in maximum tire useful life. Underinflated tires cause tire sidewalls to flex more than they are intended to, resulting in overheating and quicker sidewall break-down/wear. Overinflated tires mean less sidewall flex, harder ride reduced steering responsiveness are also excessive centre tread wear. Overall, proper tire inflation can lead to increased water dissipation, reduced rolling resistance, decent traction, and reduced tread movement. The result of proper tire inflation includes safe vehicle handling and load carrying capabilities. Wheel balancing may relieve some symptoms of improper tire wear, such as excessive lean. However, abnormal tire wear may also be the cause of alignment issues. 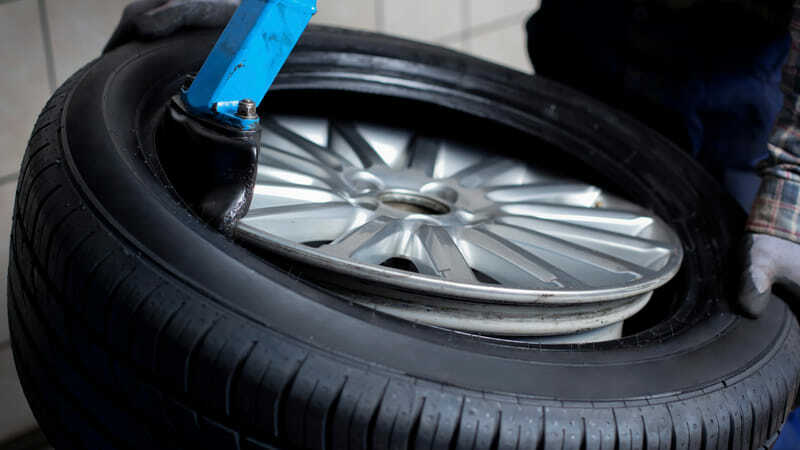 During any tire repair service, our tire experts will inspect your tires to determine whether a wheel balancing or tire rotation service is needed to resolve your current tire issues. Tire inflation is so important that our staff will take care to follow the vehicle manufacturer recommended pressures during a new tire installation or tire repair service. Repairing a flat tire can save money by extending its useful life. Hyack Excel Tire is happy to save you money by making repair to flat tire when possible. We will first dismount the flat tire and inspect it inside and out to ensure that the tire’s internal structure is intact and that it can safely bear the load of the vehicle. If the puncture is in the tread and is smaller than 0.25 inches in diameter, it may be possible to repair the tire. However long, deep cuts into the tire that go beyond the tread, or punctures or damage to the sidewalls, cannot be repaired.